I have yet to run out of gas in my car. (hopefully I didn’t just jinx myself.) It can get pretty nerve racking though. On my daily work commute the only convenient gas station is right by my house. I’m sometimes halfway to work before I realize that I don’t have enough juice to make it back home. The closest I came to stalling was a trip home from work where I thought I could make it home to get gas but was foiled by an accident that caused a massive traffic backup. Luckily the exit I took had a gas station only a few miles from the expressway. Book 2 bonus! 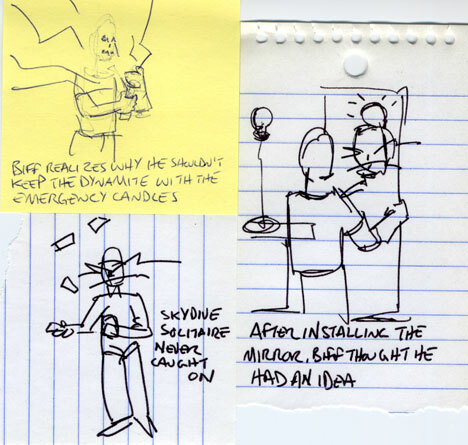 When I first think of an idea for a comic I usually do a little sketch of it on a scrap of paper. Well I now have a box full of scraps just sitting there not entertaining anyone. So I decided that the first 100 or so pre-orders for book 2 will get one of these scraps of Biff included with their order. Marvel at my bad spelling! Be confused by an early version of the caption! Use it as a book mark! These will be handed out on a first come first served basis and limited to only the comics printed in book 2, so if this is totally awesome to you then order quickly! Most excellent. Also, kudos on not stalling, Chris. Wow, I’m surprised three people got here before I did. Usually I’m first or second. Anyways, I suppose we are now sure that this is, indeed, time travel week. And it doesn’t matter how far you walk, Biff. But keep on going anyways. It entertains us. Also, “0472 – Stall”? Might wanna fix that. Wow… I really can’t understand this one, and I don’t know why. Somebody help? Chris, when I was a little kid, that was a fear for me… I would always watch my mom or dad’s gas meter and remind them to stop. I knew that I didn’t want to push a car, and I don’t know why I was so crazy about it, I just was… odd little things we have as kids, eh? I have a printout of the “Biff thought he had an idea” comic on my studio wall! It’s cool to see the sketch of that one. How does Pre-order option 5 work? Do we put our idea down in the Personalization instructions or send them in a separate email? This particular option intrigues me. @sakanagai – A separate email works the best. Disregard my previous comment. The personalization line doesn’t allow enough characters for the comic description; email it is! 1. Biff’s car breaks down. 2. He gets some extra gas and commences walking toward car. @silicon giraffe- My crazy little thing as a kid-in-the-car was watching the windshield wipers. The funniest time was when I was four or five, my dad and I were coming back from Chuck e cheese’s when it started raining… really really hard. When my dad put the windshield wipers on, I began moving my from side to side, like, shaking it. My dad saw this and thought “what is he doing?” so he put the windshield wipers on a bit higher and I started shaking my head a bit faster, in time with the windshield wipers. We kept going like that for about thirty seconds, when it finally reached the highest speed, and my head was shaking pretty fast and I was about to throw up when he suddenly turned them off and I immediatley fell back and fell asleep. I’ve never completely run out of gas, but I have been 20+ miles away from the closest gas station when my “out of gas” light came on. I drove until it sputtered once, then pushed it the final 4 miles to the station. I filled up and drove off with no further problems. Stop smelling the fumes Biff!!! This is sure to jack up oil prices even more! Unless some pixy decided to swim in that gas. Finally, my investment in a leprechaun payed off. About this theme week, i don’t like it when someone attempts to use time travel because it always wierd and has loopholes, but I geuss that’s Biff in a nutshell, a time traveling nutshell! This week’s comics so far have really done an excellent job with humor by implication. The panels are remarkably mundane–Biff drinking milk, Biff at the grocery store, Biff hiking along the road looking for gas–but the juxtaposed time-travel captions totally recontextualize the images. And that’s awesome. I think that of the time-travel comics so far, today’s is my favorite. It’s so absurd, and it raises the possibility that Biff has been time traveling so much, he can’t even remember what year he last went to. Forgetting the time period has become as everyday to him as forgetting your wallet or keys. you know, ¡el pingüino bilingüe¿, biff could probably fit inside a nutshell anyway. Well, Biff’s been known to time travel entirely by accident, such as when he fell over and landed in the 1970’s… I suspect that winding up in the wrong year is entirely unsurprising to him by now. You would think Biff would get a watch or a calender to remind him what year he is from. If I was traveling through time, that’s what I do. When I was a kid, running out of gas didn’t scare me. Going through a carwash? That scared the hell out of me! I can still remember the terrifying fuzzy blue and red monsters coming for me. I swear, they were leering at me with their evil eyes! Steve-o, how would he have gotten gas in 1723? 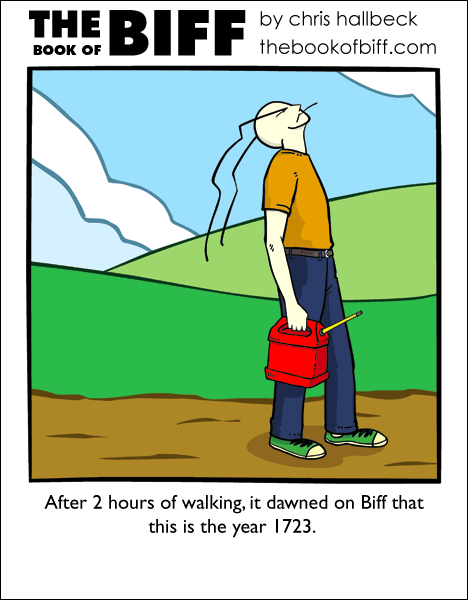 Wouldn’t it make more sense that he went back to 1723, forgot that he’d done so, ran out of gas for his DeLorean, and started walking to get more only to realize that it was impossible? I feel smart for figuring out that it was a time traveling car on the first read. Heh. wow… It seems Biff has been playing with time lately… I see bad things happening… like he opens a vertex to the real world or something. This comic keeps giving me the mental image of Biff sitting in the DeLorean from Back to the Future, one of his eyebrows sticking out of the driver’s side window, and Marty trying to explain to Doc Brown that this weirdo with long eyebrows stole it from him. Hmm. I wonder. Biff’s eyebrows as a carjacking weapon? My mind goes very strange places. I have never run out of gas, despite the fact that the gas gauge on my car is busted. It still moves up and down, but somewhere between when it reads that you have 1/4th of a tank and 1/8th of a tank is when you run out of gas. When it was my father’s car he ran out of gas in it – that’s how we found out the gauge was busted – and recently my sister, who is using it while I’m at college, ran out of gas in it, but I never have. Though, the first time I put gas in it, I opened up the little door thingy and inside there’s a hornet starting to build a nest. Fortunately I noticed it before I reached for the twist-off cap thingy, else I probably would have been stung. It was weird, ’cause you’d think the gas fumes would kill the thing. Freaked the crap outta me – it’s been years since then and (except for in the winter) I still expect to see a hornet or some other kind of mean insect there when I go to put gas in my car. How did you get rid of the hornet? @ghostmaiden My dad – who was right there – used the end of the gas nozzel to knock it away from the car. It fell to the ground and he stomped on it until it died. Ah yes, I remember driving home from about 100 miles away. Needle hit the E and I kept going. Bout 20 miles away, I’m half a mile from the nearest exit, and the van starts dying. Somehow or another, I coasted it up the ramp, turned right onto a busy highway, and landed into a gas station before it died. Never stopped. @ ghostmaiden: i’m jealous of you. i’ve never been in a carwash, and really want to. i’m sad, i know. i’m surprised biff hasn’t been paradoximacated by killing himself as a kid, with all this time travelling stuff. actually, i don’t think he’s ever been a kid. i don’t know what it means, either, so don’t ask. Biff, I wish to learn the process by which one goes back in time. Preferably not by falling back off a chair. That tends to be painful. Returning from a trip at 2 AM with our kids and a visiting relative and her kids and our luggage packed into the car, my wife kept warning me to stop and get gas. “No, we can make it.”, I insisted. Six blocks from home we stalled. Too far to carry luggage and sleeping kids. Luckily a friendly policeman gave me a ride to an all-night gas station. I’ve never said,”Where are the cops when you need them.” since then. I love the expression on his face!